Jenny of ELEFANTZ: Are you ready? Three little words, yet they carry eternal significance. My husband and I have this question on our hearts and it's given us much food for contemplation and prayer recently. Are we ready? Are we truly ready? Do we love Jesus with all our heart, soul, mind and strength? Ouch! I have been listening to Jesus Culture worship music really loud in the quilt room tonight and playing computer games. What food for thought. I'm ready! 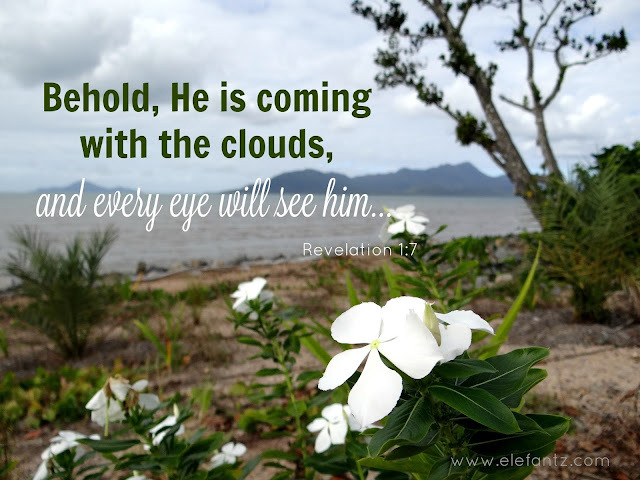 And I believe HE Is coming soon! Always a struggle for me. But I keep trying. YES, I am ready. But I'm not homesick. Thank you for this post! I cannot wait for Christ's return but "ready" is something that must be on my heart and mind at all times!! I realize just how silly things can consume my thoughts too often. I want to be ready! I am sooo ready. I cannot wait for Him to return. This old world is becoming so unrecognizable it makes me sick. I listened to Dr. Charles Stanley last evening and he spoke about this. Yes, I believe I am ready, I've repented of my sins and I know in my heart He has forgiven me. God is good all the time, all the time, God is good. Thank you, Jenny, for this timely post! It's something I need to do - something we all need to consider. Hugs to you in Jesus. I do this off and on, for course corrections, as you've described. There are always corrections to make! Thanks for another beautiful thought. Je ne sais pas si je suis prête mais, je sais que ma foi a encore grandi quand le prêtre à côté de chez nous s'est fait assassiné sauvagement, Jésus m'a poussé en dehors de ma maison sans peur.